In the viewpoint of modern science, a living system is neither in disorder, no in high order, but in a coherent state as long as the living system is in a good condition. However, the coherent state is not a static one, but a very dynamic one, vibrating permanent between disorder state and high order state. It is natural for any living system, including human being. 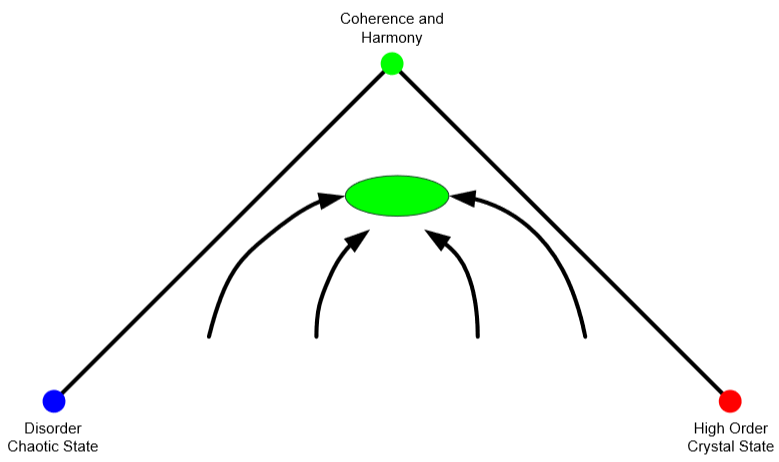 Coherent state is a dynamic one and always vibrating between order and disorder. 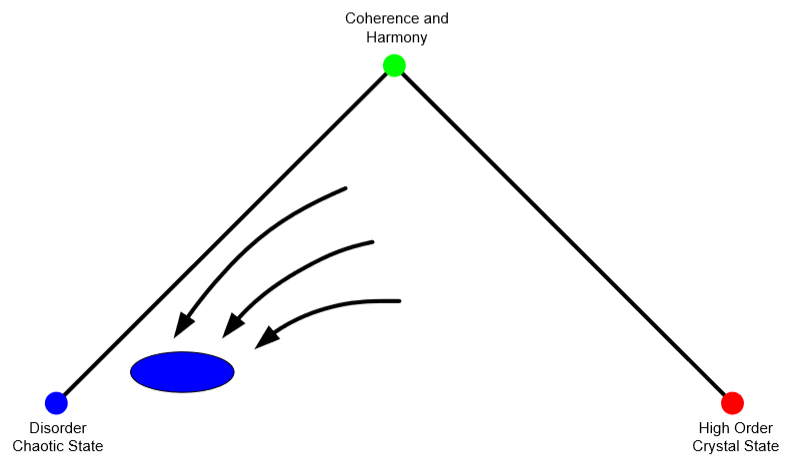 In the Biomonitor instrument, such an ideal is perceivably and quantitatively expressed with a “harmony pyramid” which is a two dimensional co-ordinate system with a point in it. 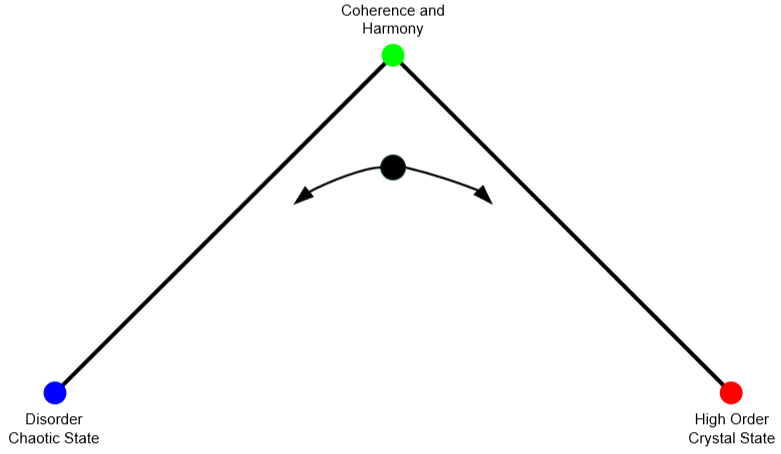 The point expresses the current state of a person and is always vibrating in the “ harmony pyramid” in the ordinary situation of the person (see Figure 1). Mathematically, we call the artificial co-ordinate system as an “abstract space” or a “state space” which is able to describe a state which is determined by countless factors, even infinite factors, briefly and perceivably. 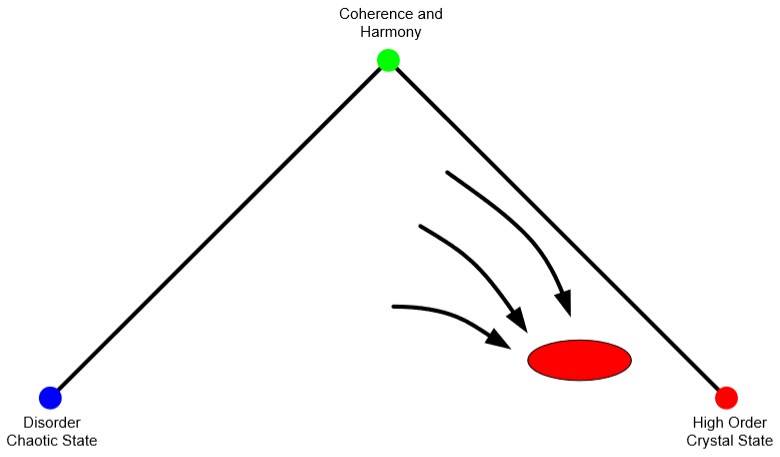 The vibration of the state of a body between order and disorder could be expressed by means of a two dimensional co-ordinate system “ Harmony Pyramid” on the screen of computer with the Biomonitor instrument. In such a concise expression, the state of a person should always be near the top of the pyramid and vibrating around it if both the mind and the body of the person are always in a quite good state. The dynamic balance would, of course, be broken time to time temporally by many disturbs such a bad news, social problem, family problem, bad weather, too much work, irregular life style and so on. However, if the person is quite healthy physiologically and psychologically, he or she would regain the balance in quite short time as soon as the disturb is over. If a person is out of such a dynamic balance for a very long period, it is the beginning of many diseases, in particular the person loses the ability to regain the balance. This is basic idea of many natural medicines and psychosomatic medicine as well. There are two typical cases of losing balance. One typical case is that the state of a person is somehow always kept in the left corner, it could be the beginning of many infectious diseases, since it shows that the person is too weak to resist outside disturb and the disturb lasts too long. If such a state lasts several months or even longer, it could be a potential danger of many big infectious diseases, even degenerative diseases , because it means the person is in a long-term frustration and goes into some wrong state, which is called “chronic chaotic state” under some kind of long time pressure without the possibility of escaping from it. Of course, such a long time pressure would usually be over because of the permanent change of social situation and the state of the mind and body of the person could go back the harmony region again afterwards. Unfortunately, the seed of many big diseases, even degenerative diseases, has been planted inside the body, grow up after the incubation period which is usually one year, and then be found by means of so called “early diagnosis”, but it is already much too late, as we know. Another typical case is that the state of a person is always in the right corner, it could be the beginning of many allergic diseases since it shows the body has too strong reaction toward outside disturbs. If such a state lasts too long, it would be a potential danger of hypertension or rheumatism, because it means the body is sticked on some “chronic over coupling state” even when the outside disturb is over. 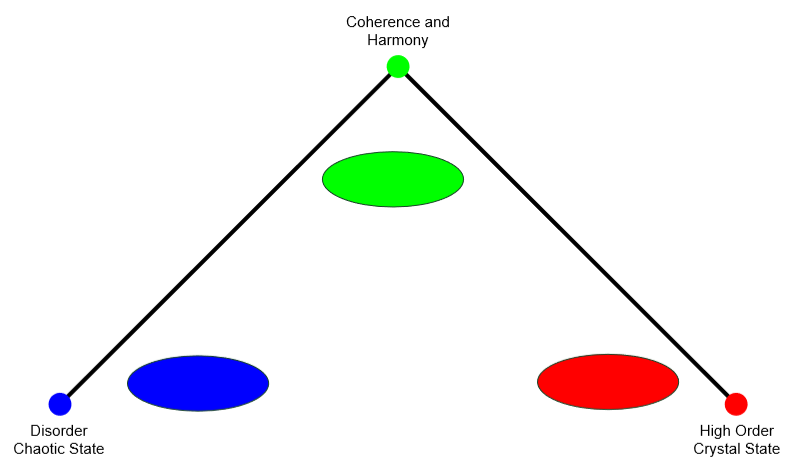 We may simply describe the three different situations with three regions with three colors in the “Harmonic Pyramid” ( see Figure 2 ). For instance, if the state of a person is always vibrating in the green region and has the ability to come back in a short time after some disturb, he or she is always “as fit as a fiddle”. The three states of harmonization are defined as follows: Red Area: The patient is at potential risk of high blood pressure or developing an allergy if not already present at the moment of measurement. Blue Area: The black area indicates the presence or development of infectious and degenerative diseases. Green Area: The declared aim of the nature therapy is to bring to patient now back into a healthy balance, which is indicated by the green area. It seems quite easy to regain harmony if we can do something which is counterbalance the “chaotic state” or “crystal state”. It is easy indeed if the person is young and basically quite healthy. For instance, a good sleep, namely, a deep relaxation” at night could usually well balance the stress which was accumulated in the concentrating working in day time. In the language of mathematics, the “green region” is an “attractor” in the “state space” (see Figure 3), which is attracting all other points that are not in this region. In other words, if the state of a quite healthy person is out off balance due to some social problem, family problem, weather problem or some other disturb, it would usually automatically come back to the “green region” without the help of any therapy or remedy. Sometimes the disturb is too big or too long for the person to regain the harmonic state in short time, therapy or remedy would usually help the person regain the balance in a relatively short time. It is also quite good, in particular in the case of acute diseases which is the strong point of conventional school medicine, as we know. Unfortunately, it is not always the case for every person. If a person is weaker, he or she takes longer time to recover from disturb than others. Therefore, the person needs more medical help than others too. What is even worse is that some person would somehow establish a “wrong attractor” which becomes the usual, even the normal state for this poor person. The “wrong attractor” would attract the point that is even in the green region into the wrong place in the “state space” (see Figure 4 and 5 ). The position of a “wrong attractor” is usually determined not only by some unhappy experience, but also by his or her basic and genetic character. If the “wrong attractor” is in the region of chaos (see the black area in Figure 4), it means the state of the person is always wandering inside or near the chaotic state. This kind of person is usually easy to depress, frustrate, therefore is easy to get infectious diseases, or even degenerative diseases. Sometimes, a happy party or a therapy could cheer this kind of persons up for some period, but the effect usually does not last long. Mathematically, it shows that the “blue wrong attractor” (see Figure 4) is always drawing the state of the poor person back the disorder place, just like a ghost haunts him or her permanently and chronically. A “wrong attractor” (the blue area) in the region of chaos. However, some person has a “wrong attractor” in the region of “High Order” (see Figure 5). This kind of persons is usually active with a quick temper. Sometimes, a good vacation or meditation may calm them down for a short time, but the effect usually does not last long. Mathematically, it shows that the “red wrong attractor” (see Figure 5) is always drawing the state of the poor person back the unnecessarily high order place. It is easy to see that as long as a wrong attractor has been established, both doctor and patient need great patience in the persistently pursuing short-term effect and long-term effectiveness in therapies. A “wrong attractor” (the red area) in the region of high order. Of course, what we discuss here is only the three typical cases. In reality, the situation is much more complicated than that. However, the principle is the same, that is, the purpose of any therapy, in particular of the natural therapies, is how to help patients or people to get rid of a wrong attractor and to regain the dynamic balance and the BIOMONITOR instrument is a good assistant for medical doctors or practitioner to monitor the patient and to see the short-term reaction during therapy and the long-term effectiveness after a period of therapy.